Sometimes we don’t even need to leave town to see wildlife like this moose! Moose continue to be the stars of the show in Grand Teton National Park. Guide Mike Vanian’s video perfectly showcased the moose strutting under the beautiful view of the Tetons, you can check it out here. A video of a moose in a snowstorm from last week by guide Laura Krusheski shows off the resilience of these beasts even through the blinding snow. 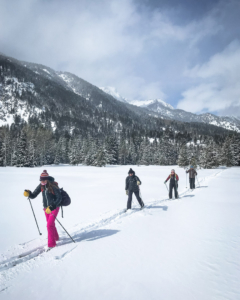 Finally, content for the week includes photos from a recent cross country ski tour (6 mile loop in the Granite Canyon area! 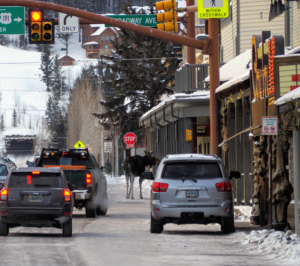 ), a snowy bison, and a moose walking through town. 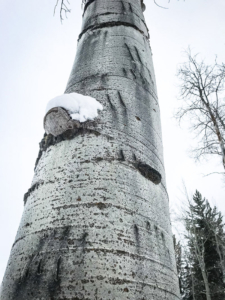 photo of claw marks all the way up an aspen tree! Though we usually don’t start seeing bears until April or May, it is possible some grizzlies could emerge if we get a warm spell in March. March marks a shift towards spring in the Greater Yellowstone Ecosystem, we can expect to start seeing our first returning songbirds like mountain bluebirds and redwing blackbirds. Canada geese will be preparing to nest soon, and many bald eagles may already be nesting! To read more from Ecotour Adventures, check out their latest blogs on their website here. Daily Trail Report | Last Day to Register for Pole Pedal Paddle!